The Nintendo Switch companion app is fast turning into a pretty essential part of the Switch. As well as the previously announced news that you’ll need to use the app in order to enable voice-chat on the console, in a recent interview Nintendo of America’s President Reggie Fils-Aime suggested that the app would be used for a lot more besides voice chat. In fact, the app’s functionality actually goes as far as enabling matchmaking and allowing you to create lobbies, suggesting that your online options are going to be pretty slim without your smartphone. Fils-Aime justified the decision to rely on the app for voice chat by saying that most people will have a headset that connects to their phone on them at all times. As such using the phone for voice chat makes sense, as it means you don’t have to carry around an extra Switch-specific headset. But while these justifications make a certain amount of sense for using the console while on the go, the same can’t be said for docked play, where people are used to having a dedicated headset and a console that can handle everything without needing accessories. Fils-Aime’s use of the word ‘hotspot’ also suggests that Nintendo expects people to tether their console to their phone to get online while on the go, which might prove challenging for anyone with a limited amount of data. 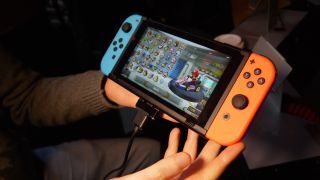 It’s beginning to feel as though in its quest to make a hybrid console, the Nintendo Switch is fast becoming a device that has limitations in both form-factors. We’ve contacted Nintendo to ask for clarification on what exactly the mobile app will enable, and what form of online play will be possible without the app.